Perjuangan means “The passionate” in Indonesian. This boat comfortably accommodates up to 7 Divers on board. Perfect for those that want to have a whole dive boat to themselves, allowing privacy and freedom to dive with your groups interest at heart. Perjuangan is a 21-­‐meter traditional boat made of ironwood, which has been renovated and launched in August 2013. 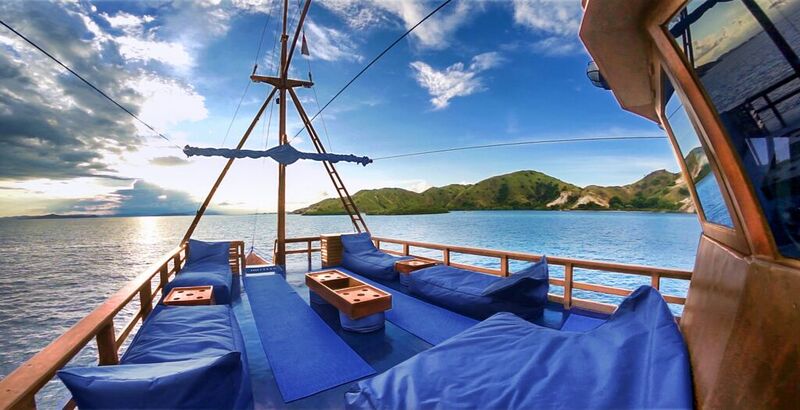 We offer exclusively private cruises in the National Park of Komodo. The living space onboard has been fully optimized in order to provide all passengers authentic and exclusive memories. The staff has been trained in the companies establishments and knows perfectly how to be discreet and remain available to make all customers’ stay memorable. The crew take special care to provide their passengers with a great diving experience as well as a great cruising and diving experience. 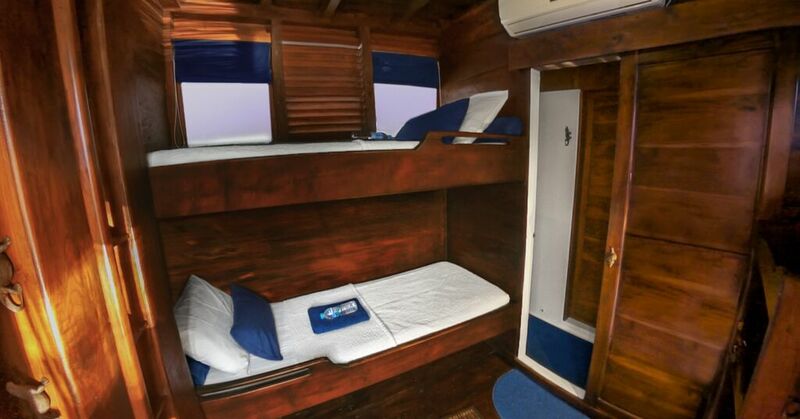 On the main deck, the three teak cabins are air-­‐conditioned; they also possess a high ceiling and their own private bathroom. 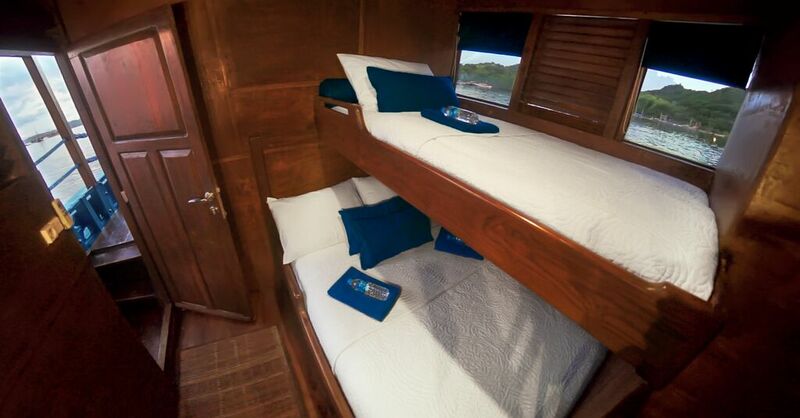 Thus, you will find a master cabin with a double bed, a cabin with two bunk beds and a cabin with a simple bed and a double bed. 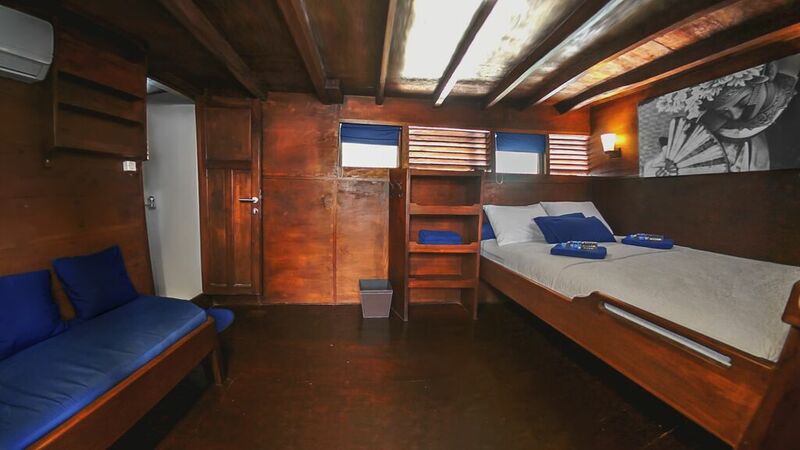 All the cabins possess windows and venetian blinds offering a sea view. Outdoor, the two large decks offer pleasant relaxing spaces, a launch platform, 2 deck showers and a speedboat. 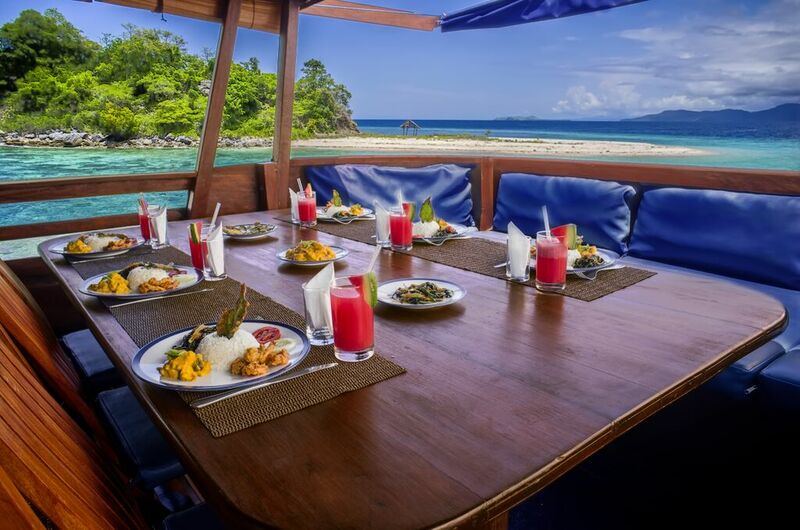 7 staff are working for the guests: 2 cooks, 1 mechanical engineer, 2 housekeepers, 1 speedboat crew, 1 captain and 1 on-­‐land hostess. Every dive is operated by a Dive Instructor who perfectly knows the diving sites and what might be seen on any dive and the likely conditions. The itineraries are defined, but we also adapt them to every diving level and every sensibility. A walk up a hill at sunset? An improvised BBQ on the beach? Fishing outside the park? Going surfing or rolling donut? Walking through the mangrove? 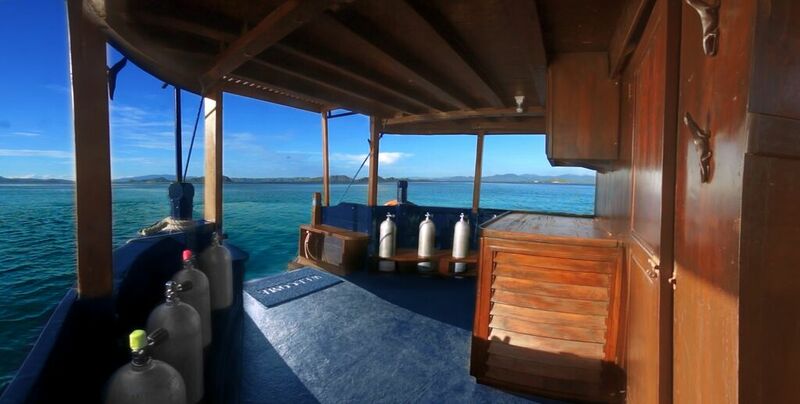 Diving aficionados as well as family divers will surely find their happiness aboard Perjuangan. “Discovering the land by the sea” is the first motto of Perjuangan. Along its different itineraries, you will discover deserted beaches, white sandy creeks, and in few centimeters of water, you will be amazed by the richness of its marine fauna, which is always different wherever the ship drops anchor. The most beautiful beaches, the clearest water, the most amazing sunsets: every cruise is unique and every day spent aboard Perjuangan will never cease to amaze you. 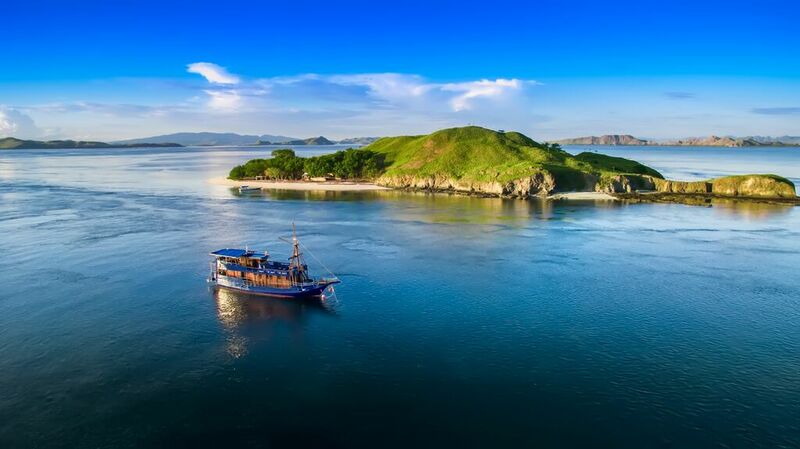 On land, meet the famous Komodo dragon, the only survivor of the Prehistoric era and discover breathtaking panoramas. And under the sea, enjoy the richness of the marine ecosystem: swim with manta rays or sea turtles, observe the most beautiful corals and be amazed by hundreds of species of fishes. Perjuangan offers the best living comfort onboard in order to provide you unforgettable memories of your cruise across the archipelago of Komodo. The sites of Sabolan Kecil and Sabolan Besar both offer interesting dives and are close to Labuan Bajo. 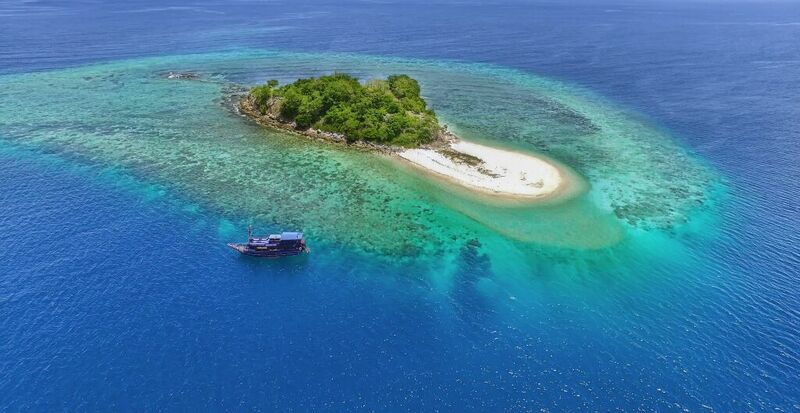 The two islands abound in large schools of reef fishes, sea turtles, cuttlefishes, giant gorgonians, and possess beautiful corals in its low-lying areas. 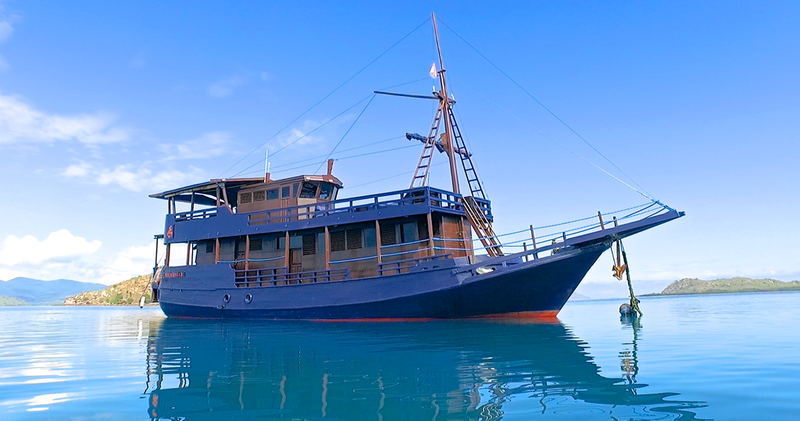 In other words, it is the perfect place to start your diving adventures in Komodo. The most attentive ones will also be able to spot mantis shrimps, pygmy seahorses or nudibranchs. Sebayur Kecil The Northwest corner of Sebayur Kecil is one of the best dive sites close to Labuan Bajo. A small reef stretches toward the Northwest and covers higher depths, only a few meters away from the shore. You will find big rocks around which you can see groups of giant trevallies, silvertip sharks, pink salmons or orange roughies. The current can be strong in this area. Mini Wall Mini Wall is located near Sebayur Kecil. It is an excellent site to check on your diving level or simply to have an easy and wonderful dive if you don’t want to follow the current. The entry point is the same than Sebayur, but the dive goes toward the left in order to give you the opportunity to discover a unique underwater topography. The plateau hosts about twenty species of reef fishes and leads to an impressive fall with a wall which is over 35 meters deep. You will be able to see spotted eagle rays or catch sight of platax or harlequin sweetlips swimming along the wall. The sand falls often host De Beaufort’s flat heads. Tatawa Besar From the Northwest corner of the island of Tatawa, we can find an excellent drifting dive site on both East and West sides of the island, in water from 8 to 20 meters deep. The reef is full of life and offers an infinite range of soft corals. Manta rays can be spotted in this area as well. Usually, it is an easy drifting dive, but it can become really fast during the falling tide. Batu Bolong Batu Bolong is a small rocky island in the strait between the islands of Tatawa and Komodo. This rock is one of the best dive sites of the park, but it can only be visited during the slack tide, when the current is not too strong. This area is really well-preserved thanks to the current and the topography of the site (steep sides) which protect it. The dive starts close to the surface with colorful corals and other invertebrates as well as thousands of small multicolored fishes. In deeper waters, along the steep, we can find many bigger species such as sharks, humphead wrasses, giant trevallies or dogtooth tunas. Karang Makassar / Manta Point Makasar is a long and soft drifting dive. The area is renowned for its large gatherings of up to 100 manta rays. Mantas can be found on the site when good conditions are gathered and depending on the season. We can also find large schools of humphead parrotfishes, marble rays, bamboo sharks and many other species on rich rocky outcrops. Do not miss this spot if manta rays are there in large number. Siaba Kecil offers one the the best drifting dives of the park. You will dive from the North of the island to the South and follow the edge of the reef at a depth of 8 to 20 meters. The current can be really strong on this reef. It is filled with small caves which shelter angelfishes, harlequin sweetlips or giant trevallies. At the end of the dive, you will be pushed upwards on an underwater plateau where you can find a garden of virgin corals which hosts many sea turtles and mandarin fishes. Batu Tiga Batu Tiga’s topography is very similar to Tatawa Kecil and is very affected by the current, because of the bottleneck which appears between Komodo and Rinca. It is crucial to get in the water at the perfect moment and this dive is only recommended for experienced divers. There are three rocky peaks which begin underwater at low diving depth and stretch to the surface. A striking characteristic of this dive site is the large canyon with huge rocks on each side. Sharks and large schools of barracudas, snappers, platax, trevallies or fusiliers all go through this way. Castle Rock This seamount is one of the best dive sites in Komodo and usually offers an excellent visibility. Normally, the current circulates to the East and is much stronger on the surface than in deep waters. You will be able to spot friendly platax, schools of barraducas, trevallies and mackerels. At about 20 meters deep, numerous soft corals shelter the famous pygmy seahorse. The top of the rock is 3 or 4 meters deep and builds a shelter against the current, which gave its name, Castle Rock. It is the right place to look around you during the safety stop. Crystal Bommie The top of Crystal Bommie is exposed at low tide. This site’s water is extremely clear and offers a great visibility. This dive is very colorful, with a superb seabed of soft corals, where the current can sometimes be a little bit strong. It generally circulates toward the East. The best moment to dive is at slack slow tide. Mudskippers, morays or scorpion fishes can frequently be observed on this site. Thousands of anthiinaes and schools of harlequin sweetlips are always there. You will find a small mound in the Northwest where many different species are living. Tunas and mackerels also often frequent this site. It is an excellent dive site and is usually worth being visited twice. Tengah Kecil Tengah is an unsettled dive site. Because of its location in the park, it generally offers less visibility than the other sites. However, on a good day, Tengah can easily become the best site of the park. Jump and admire schools of giant trevallies and sharks play in the current. When you reach the plateau, rich gardens of hard and soft corals cover almost every inch of the coral reef. Schools of fishes are everywhere, the macro will even leave the most experienced divers excited. In the middle of the site, you will also find a large number of table corals hosting baby sharks. Because of the unpredictable conditions, Tengah is more suitable for experienced divers. Wainilu Wainilu is the small « Lembeh » of Komodo. If you are looking for some macro, this site is perfect. At first sight, we can see a shallow bottom of broken corals, but if we look closer, we can catch sight of some rare creatures of Komodo. Ribbon eels, demon stingers, mandarinfishes, mudskippers, harlequin sweetlips and numerous species of nudibranchs are also part of the fauna of Wainilu.